OBI strip and resealable "Japanese-style" plastic sleeve. 145 gram vinyl; Gatefold jacket; Hand-numbered edition of 1000. Download card for WAV files of the album and bonus tracks from solo releases from Nyoni and his Born Free band. Contains booklet that presents an overview of the Zamrock scene, Nyoni's story, and the confluence of the Zimbabwean and Zambian rock scenes in the '70s. "The latest release in Now-Again's deluxe Reserve Edition series: the first ever anthology of Zamrock musician Mike Nyoni's funky, psych-rock and folkloric 1970s recordings spread over 2 CDs. Zambian guitarist and singer/songwriter Mike Nyoni's music is Zamrock only because he came of age during the country's rock revolution. His preferred wah-wah to fuzz guitar, James Brown to Jimi Hendrix. His 70s recordings -- often politically charged and ranging from despondent to exuberant -- are amongst the funkiest on the African continent. 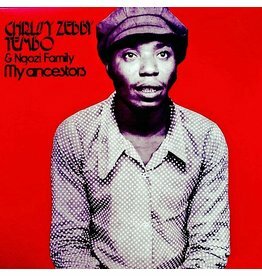 He was also one of the only Zamrock musicians to see his music contemporaneously issued in Europe. This anthology collates works from his three 70s LPs -- his first, with the Born Free band, and his two solo albums Kawalala and I Can't Understand You -- and presents a singular Zambian musician on par with celebrated artists Rikki Ililonga, Keith Mlevhu and Paul Ngozi. The package also features an extensive, photo-filled booklet contains an overview of the Zamrock scene and Nyoni's story."